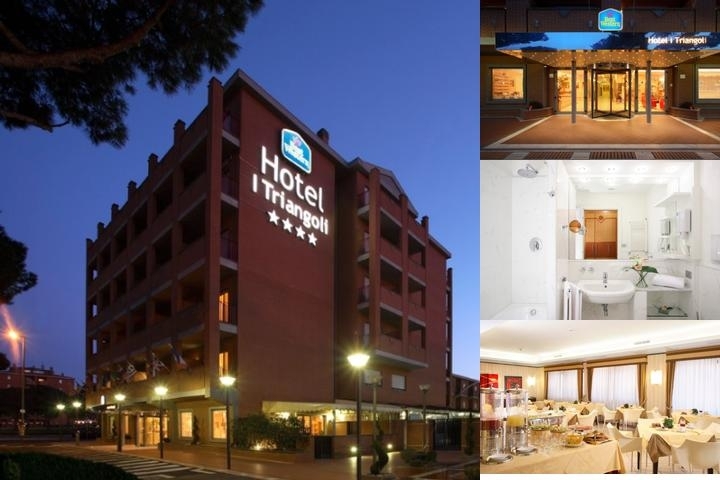 Best Western Hotel I Triangoli, is the ideal location for business travel because of the proximity with the EUR, Parco dei Medici and Laurentino areas where the biggest enterprises and multinational company are based, and for holiday stay and leisure travel because of the proximity with the Rome Sea Ostia Beach and the good connection with Rome downtown that takes just 20/30 minutes to be reached by public transport. The reception at the Best Western Hotel I Triangoli Rome is open 24 hours a day and the hotel staff are available to fulfil any request: helping to book tickets for museums, exhibitions, trains and flights and assisting with car hire, postal services, printing and photocopying and left luggage. Free Wi-Fi in room and in the common areas L'Hotel I Triangoli also takes care of its youngest guests, providing a baby-sitting service on request. The BEST WESTERN I Triangoli in Rome has 80 Rooms on 5 floors with lift , all the rooms are equipped with the latest standards to ensure you an enjoyable stay.The rooms have air conditioning, LCD TV, wi-fi connection free of charge, minibar, telephone and safe. Bathroom with bathtube and waterfall showerThe Hotel I Triangoli has rooms for disabled. Double Single Use Room20 Sqmt. Queen Size bed, marble bathroom with waterfall shower, wi-fi and wired internet connection free of charge, minibar, air conditioned, safe available also for lap top, most of them with a small balcony with table ad chairs, LCD TV, Mediaset Premium. Double Classic20 Sqmt. Queen Size bed, marble bathroom with waterfall shower, wi-fi and wired internet connection free of charge, minibar, air conditioned, safe available also for lap top, most of them with a small balcony with table ad chairs, LCD TV, Mediaset Premium. Triple Room20 Sqmt. Queen Size bed or twin beds, rollaway bed, marble bathroom with waterfall shower, wi-fi and wired internet connection free of charge, minibar, air conditioned, safe available also for lap top, most of them with a small balcony with table ad chairs, LCD TV, Mediaset Premium.